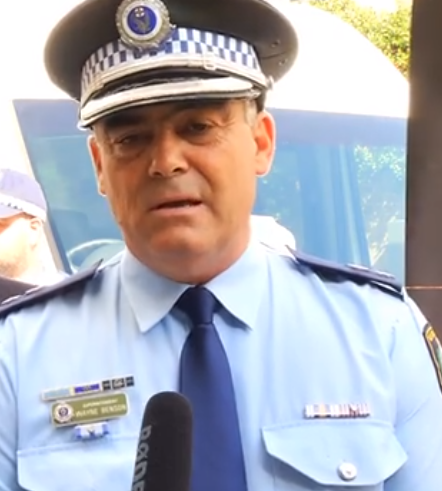 Campbelltown City Police Area Commander, Superintendent Wayne Benson, says even the smallest piece of information can help make a big difference to police investigations. Speaking ahead of today’s launch of “Dob in a Dealer” campaign in the Lithgow Street Mall with Mr Peter Price, the chief executive officer of Crime Stoppers NSW, the Campbelltown police chief said the public should not have any qualms about providing information. “Members of the public should not feel bad about dobbing in drug dealers as they do not care about you or your family, the do not care if people become addicted, commit crimes to feed their habit, or overdose and die – they only care about the money they can make,’’ Supt Benson, pictured below, said. “Almost every day, police in this area see the effects of illicit drugs in the community. “We want to turn this situation around and I am sure the people who live here do too. “The community can help police stem the flow of drugs by providing confidential information about those involved in the manufacture and supply. “We are asking the community to help us. Our best weapons in the fight against the manufacture and sales of illicit drugs are the eyes and ears of the public,” Supt Benson said. The “Dob in a Dealer” campaign, which has been funded by the Commonwealth Government, is aimed at stopping Australia’s supply of illicit drugs including ice, cocaine, MDMA, heroin and cannabis. As part of the campaign across 14 NSW locations, police and Crime Stoppers will be conducting intensive community-engagement activities to highlight the important role members of the public play in helping police shut down drug-manufacturing syndicates and arrest drug suppliers. Local residents are being urged to contact Crime Stoppers, to report drug-dealing activities with all information treated in the strictest of confidence.